UNESCO is the acronym for United Nations Educational, Scientific and Cultural Organization. This agency works hard to bring out the most enriched spaces of the world. Highlighting historical, cultural and scientific advancements, UNESCO sites are one of the best ways to experience a country. Cambodia has many UNESCO sites. While some of these sites are well-known among travelers, others are a bit off the beaten path. Try to visit these sites when you’re on holiday to Cambodia to ensure that your trip is well rounded. There are only 4 current UNESCO sites, but there are 8 sites that should become official UNESCO sites soon. This site was only recently accepted into the world heritage but, it’s a sight to behold. Winding trees growing well past the tops of tall stone temples, this is not an easy to get to location. But the trek is worth every step. This archaeological site is known as Sambor Prei Kuk, roughly translated to, “the temple of the richness of the forest” in Khmer. This temple zone dates back to the 6th and 7th centuries AD. There are over 100 temples of a variety of different shapes and architectures. Although most temples in this zone are square or rectangular, 10 distinct temples have an octagonal shape. These temples stand apart from many other cultural locations in Cambodia as they are pre-Angkor. These temples in fact show where much of the Angkor and Khmer styles drew their inspiration. Elements of architecture and design including pediments, colonnades, and lintels are masterful works. The art and architecture found in these temples are unique and not found anywhere else in the world. Within the temple zone of Sambor Prei Kuk, is the archeological site of Ishanapura. Ishanapura was the capital of the area for many centuries, different empires and many different rulers. Although it is part of the world heritage site because it is within the temple zone of Sambor Prei Kuk, it deserves its honorary mention. Ishanapura was capital to the Chenla empire. Although it was is known as a Khmer civilization, the Chenla Empire predates the Khmer empire which rose in Angkor. This site was essentially the hub of what would grow to become the Khmer empire and inspire the temple districts of Angkor. 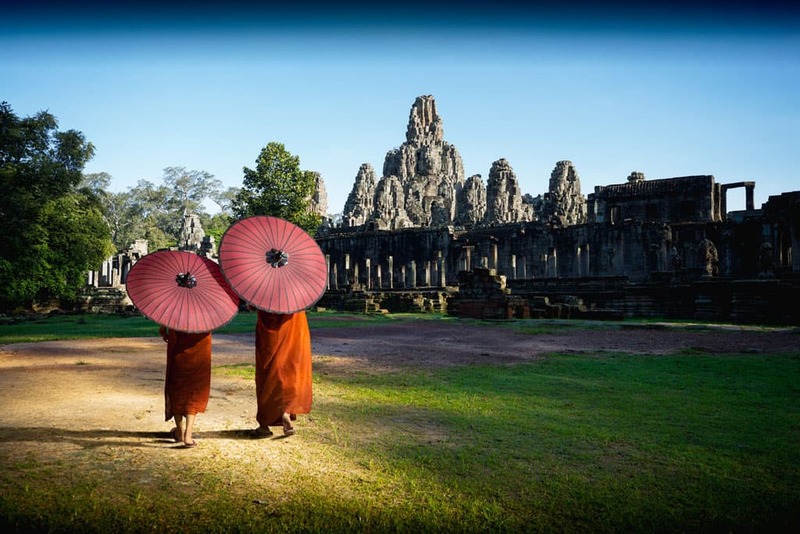 Without a doubt, Angkor is the most popular tourist destination within Cambodia. It earned the well-deserved recognition as a world heritage site in 1992. Angkor is in the greater area of Siem Reap but is host to a number of different temples. The fact that Angkor is not one, but many temples earned it the name: “City of Temples” which confuses some people. If you’re planning a trip to Angkor, you are actually planning a trip to Siem Reap. After you get your visa to visit Cambodia, you’ll also need a pass to enter Angkor. This pass usually costs travelers about $20 for multiple days. If you only want to spend a day in Angkor, cheaper pass options are available. Of the many temples in Angkor, you can see Hindu temples, as well as Buddhist temples from the 12th century. But, all the temples are built with the same Khmer architectural preferences. In many cases, these temples are the purest rendition of Khmer architecture. The temple of Preah Vihear is an ancient Hindu temple constructed during the Khmer Empire. But, unlike Angkor, Preah Vihear does not sit among many other temples in a bustling city. Instead, this temples sits at the top of the Dangrek Mountains. Unfortunately, this temple is also the site of a lot of bloodshed and war in recent years. International agencies were called in to decide whether this temple belonged justly to Cambodia or Thailand. It is important to note that the temple of Preah Vihear is safe now and open to tourists. But, because the area was caught between the 2 countries, much of the temple is untouched. You’ll find that you’ll need to take an extra day in your travelers to experience Preah Vihear, but it’s worth it. You might have had a few destinations in mind that you were sure were UNESCO sites. If you didn’t find them on the list above, they might still be going through the process of becoming a UNESCO site. These sites are currently working their way through the requirements to become an official site. The process can go on for years. Even though these aren’t official UNESCO sites, they are still cultural, and historical points of interest for many travelers. Don’t hesitate to visit these great places! As Cambodia is home to 3 official World Heritage sites, it is becoming a hot spot for travelers who love history and culture. This boost is great for Cambodia as they are working their way out of poverty. The country is full of welcoming, warm, and understanding people. Always take care when visiting these sites to appreciate the culture and years of war that built them. As these sites are almost entirely temples, refrain from speaking loudly, or behaving rudely. Do your best to avoid any action or words that might be taken as offensive. The best rule of thumb is to treat world heritage sites as if you were in a church or similar religious establishment. Whenever possible, speak quietly, observe the dress code, and of course, thank the locals for their contribution to the world’s heritage. Many people are enjoying Angkor, Angkor Wat, the temple of Preah Vihear, and the archeological site of Ancient Ishanapura. Don’t miss out on a chance to see these amazing locations. Schedule a holiday and get your visa so you can plan a trip during the time of year that works best for you.